Few things are less appealing than living in a messy home. 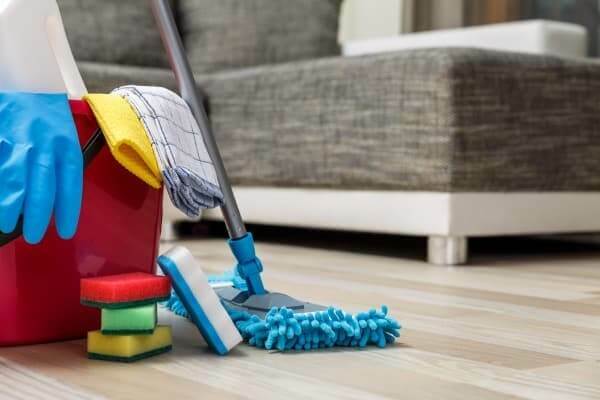 Unfortunately, busy schedules often make keeping your home clean and fresh a constant challenge. These 10 house cleaning tips from professional maids will help you reduce the time it takes to clean each week. It’s a good idea to remove larger items from the floor and tables before starting any home cleaning project. Removing clutter means picking up items off the floor, removing mats, emptying trash cans, and clearing off counters. After removing these items, you can work faster and also resist the temptation to just clean around them. Creating an organization system that is effective and works well for you is crucial to making your cleaning as efficient and effective as possible. Getting organized means creating a system for what gets done and in what order. It also means keeping all your cleaning supplies together in one place, perhaps in a cleaning caddy. (Choosing both multi-surface cleaners and multitasking cleaning tools is a way to keep things simple.) Once you’ve gathered your cleaning supplies, it’s time to create a system for cleaning. It’s recommended to move top to bottom and from left to right in a room while you’re cleaning. Having designated boxes or bins for storage makes quickly putting away toys and other stray items around the house a breeze. The boxes can be used for permanent storage or as a place to temporarily keep items until you have more time to put them away later. These will help you keep items picked up and out of the way on a daily basis. It’s hard to beat a toothbrush as an all-purpose house cleaning tool. Everything from sinks and faucets to hard-to-reach spots in window sills can be cleaned with a toothbrush. Make sure to use a toothbrush that has hard bristles since soft bristles won’t clean as well and will wear out much faster. It’s a good idea to use different colored brushes for different home cleaning jobs. To clean hard to reach places in your home, secure a cloth to the end of a yardstick with a rubber band. Now you have a great tool for reaching behind the fridge, under the bed, and lots of other hard-to-reach places. Many items (other than dishes) are dishwasher-safe and can be more effectively cleaned by a good run through the dishwasher than by a quick wipe down. Most household items that are made of glass, metal, ceramic, or hard plastic can go in the dishwasher. Dish drains, utensil holders, and microwave trays are just a few things that can be cleaned this way. Microwave ovens have a tendency to get really dirty and grimy. You should start a microwave cleaning by filling a microwave-safe bowl with half water and half vinegar. Microwave the mixture for 2-3 minutes. The steam from the water will soften stuck-on food, making it easier to wipe off. The vinegar will also help deodorize and sanitize the microwave, and you can even clean the outside of the oven with this mixture. It can be difficult to keep toilets clean and germ-free. To keep germs from spreading, you should clean the outside first and leave the inside of the bowl for last. It’s important to make sure both the inside and outside of the lid is cleaned as well. Whatever tools you use to clean the toilet should not be used in any other part of the house. The best way to keep your carpets and furniture from absorbing odors is to vacuum them regularly. There are a number of options to remove odors from carpets, but furniture can be made out of a number of harder-to-maintain fabrics. In general, the best thing to do is to set removable cushions to air, thoroughly vacuum every surface and crevice of the furniture, and then spray with Febreze. Professional cleaners make sure to dress comfortably. This means wearing flat, supportive shoes and clothes that are machine-washable. It’s a good idea to have one outfit set aside that you wear only when cleaning your house. Make sure to have gloves or protective glasses if you plan on using bleach or other strong chemicals. These tips may help you keep your home clean, or they may simply help you keep your home somewhat less cluttered. If you’re able to take care of the day-to-day spot cleanings in your DFW area home, but still need someone to help with weekly top-to-bottom house cleanings, give Love My Maids a call.